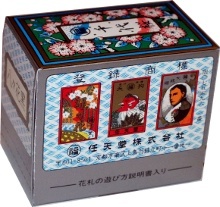 Japanese Hana Fuda, or flower cards, are probably the most widely known of Japanese cards. The cards are oblong and are made from pasteboard, brightly coloured, but smaller than Western playing cards. In earlier times they were printed from woodblocks and coloured using stencils. The backs are painted black and the turnover edges create the borders around the card faces. 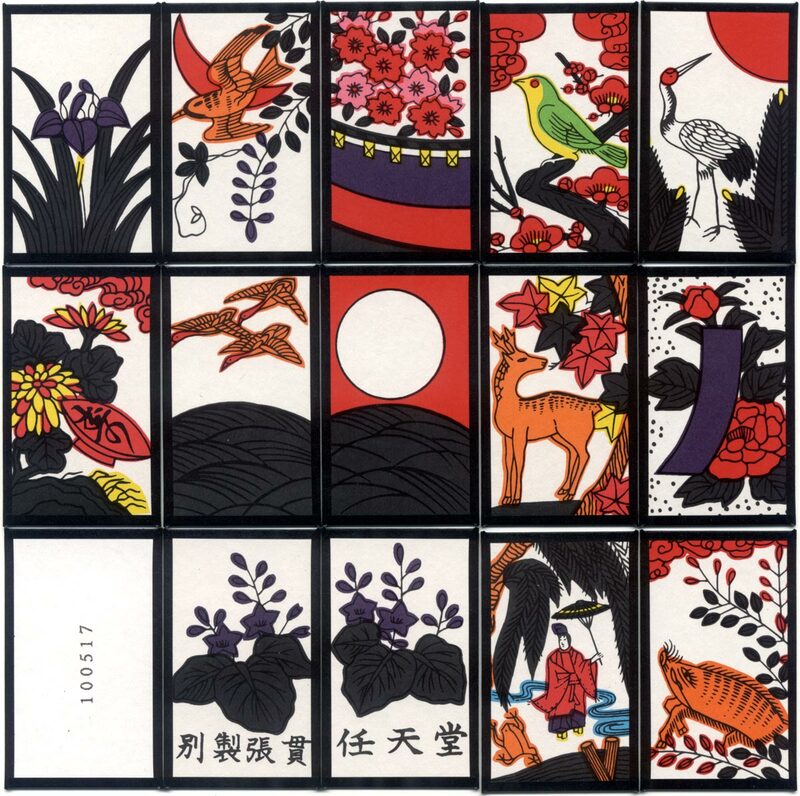 Four cards in each of the twelve suits which are named after flowers corresponding with the twelve months, plus one extra Joker card, makes a total of 49 cards. Each card is distinct. 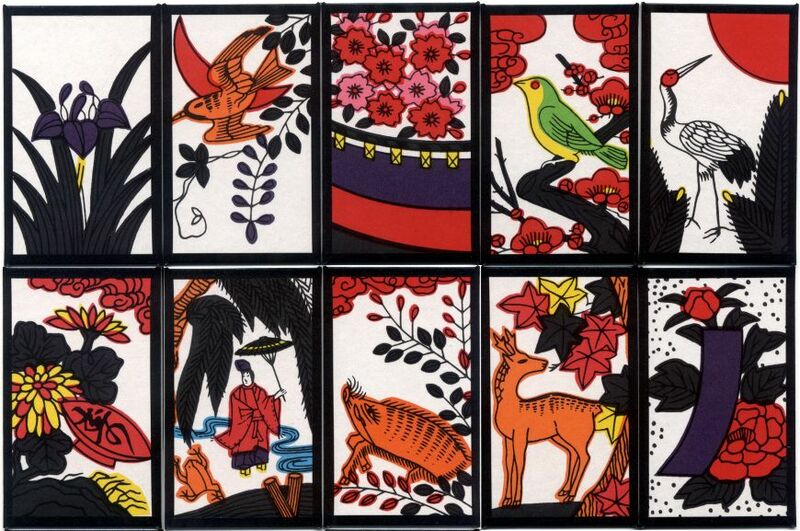 Hanafuda decks were the very first product offered by the now-famous video game maker Nintendo. January is represented by pine trees, which, on two of the cards, are shown against a lurid sky; the third one has a grayish background, that throws the trees into strong relief, and the fourth has a setting sun flecked with light clouds, the pines barely indicated in front of it, and the greater part of the card covered with the figure of a huge white-bodied, red-eyed stork. 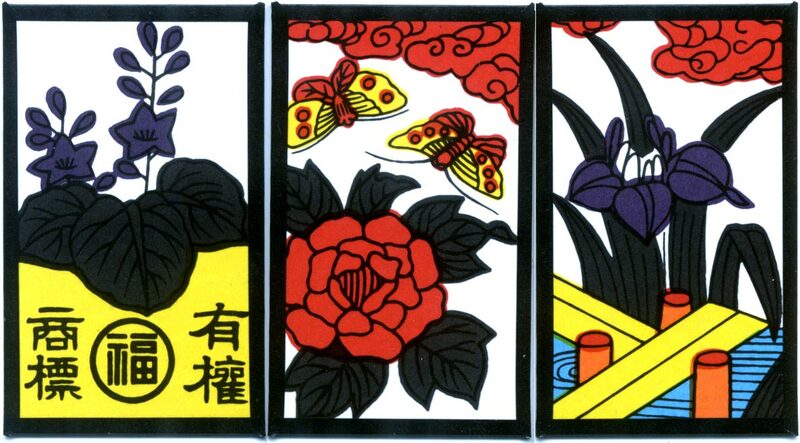 February displays as its emblem a plum-blossom, the four cards devoted to this month bearing its flower in various positions. March has a red cherry blossom, and April the hanging tendrils of the wistaria vine. On one of the cards of this suit is a wee yellow-bird, which is flying across its surface under a crimson cloud. For May there are beautiful blue iris springing from long spiky leaves. One card shows in one of its corners part of a dock or pier and also the water out of which the flower is lifting its lovely head. June is represented by blood-red peonies, over one of which two yellow butterflies are hovering. On July's cards star-shaped leaves, some yellow, some red, and some black, are scattered over their surfaces. These leaves resemble those of our gum or liquid amber trees, but thes bear the Japanese name of hagi. On one of the cards belonging to this suit a deer is represented standing under the branches of this strangely-hued tree. This is the only figure which recalls in any way the emblems used on cards belonging to other nations, as on one of the Chinese cards is found either a deer or else Chinese characters which have been translated to mean "This is a deer". August is represented by four pictures of grass-covered mountains, in three of which they are sharply defined against a clouded blue sky, and in the fourth the sun, looking hot and sultry, beams down on a treeless hill. Three birds fly across the sky on one of these cards. September bears the Mikado's flower, a yellow and red chrysanthemum; October, a maple tree with red or yellow leaves; and on one card is a yellow boar trotting off towards the symbolic tree. November shows on one of its cards a willow sharply outlined against a leaden sky. The willows a fellow-card look wind-tossed, and a long-tailed bird skims across the sky. A third card is covered with inky clouds, torrents of rain, and strange zigzags resembling forked lightning. The fourth card of this suit bears a quaint figure of a man rushing through the storm ander the willow trees and dropping his sandals in his haste, his head covered with a huge yellow umbrella. Streaks of lightning surround the little figure, and the storm of rain is well depicted in the picture. December bears the imperial Japanese plant kiri, and over one of these flowers hovers a beautiful red-crested silver-winged pheasant. The rules leaflet accompanying the pack is shown below. Cards courtesy Adam Wintle.